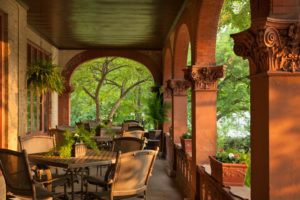 Visit wineries along the Wabash Valley Wine Trail in Southeastern, Illinois, and stay in a unique Illinois Bed & Breakfast Association member inn for comfortable accommodations and welcoming smiles. The Wabash Valley Wine Trail features several wineries within a 30-mile radius in one of the most picturesque areas in Illinois. Besides award-winning wineries, the Wabash River Valley features historical sites such as the Lincoln and George Rogers Clark Memorials. As you travel, take advantage of enjoyable shopping and sightseeing in local towns. Each winery features one-of-a-kind wines reflecting the styles of the wine-makers. The Wabash Valley Wine Trail also holds progressive dinners, so visitors can experience a special wine and dinner course pairing at each vineyard. With a special pass, guests who visit each winery on the Wabash Valley Wine Trail can receive a free gift. Your bed and breakfast innkeeper can offer more information about the various wineries and other interesting attractions and events on and near the Wabash Valley Wine Trail.